Finally Open Garden has begun. We opened to the public on Saturday, and had a bus load of visitors through on Tuesday. As always, it was wonderful to stop looking at the jobs that need doing, and just wander around and enjoy the garden with our guests. 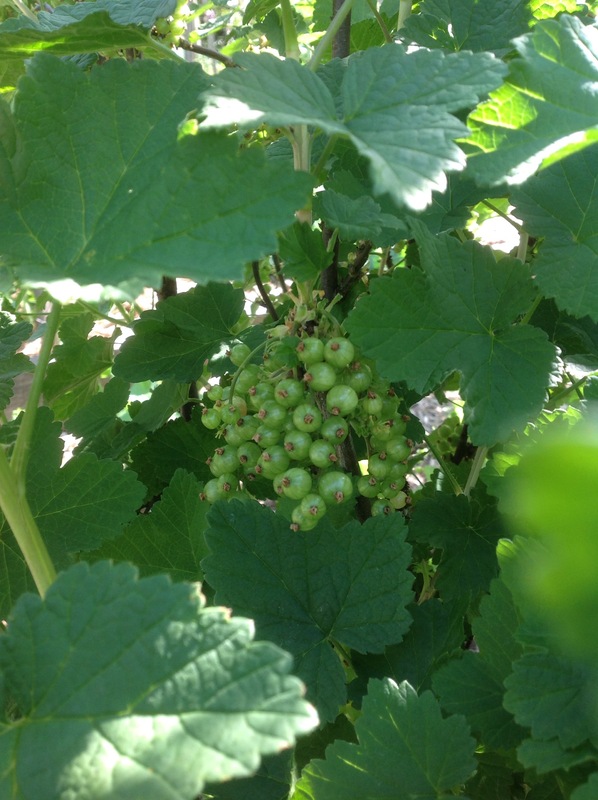 The berries are on the move, and we’ve had to net these red currants already, as the birds are pecking the middles out of them. 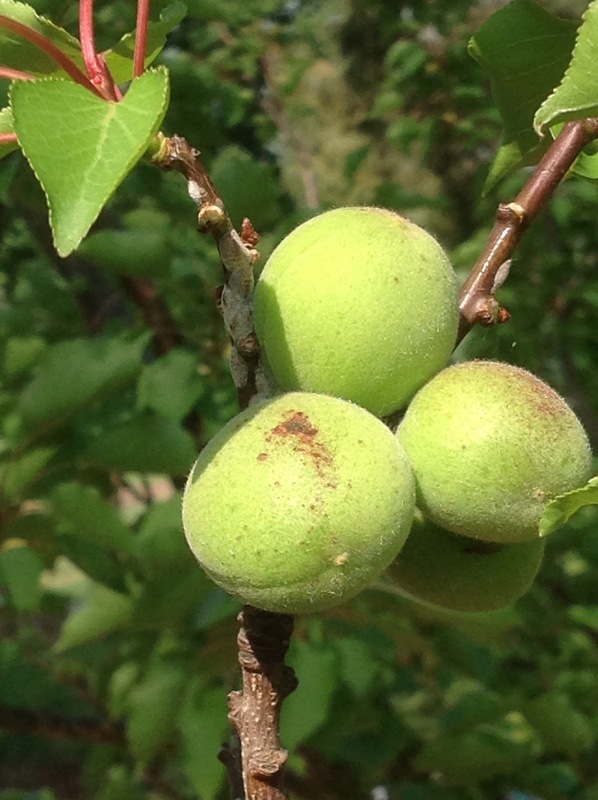 After an enormous crop of apricots last year, I thought we’d have none this season, but the bees have been busy, and we have about 50 on the tree. 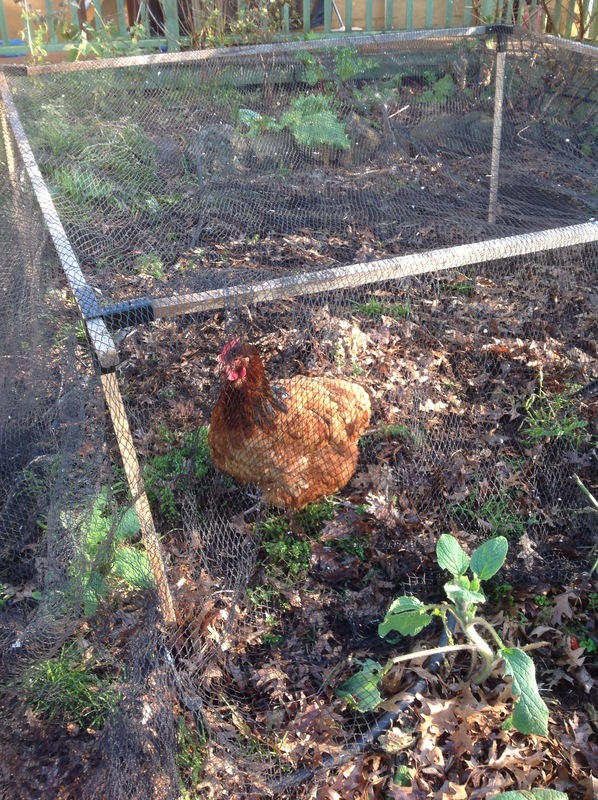 I’ve put my pumpkins and potatoes under straw down near the chickens, and have used the netting in the picture to protect them from birds. So, just one day of opening to go. It will be a big one, with a sausage sizzle, and a choir singing at 2:30. Come along if you’re local and check out what we’ve been up to! This Sunday, October 25th, from 10 to 4. We are only 11 days out from the first Open Garden. Unlike last time, which saw me preparing for the day in hail and freezing temperatures, this year the weather has turned up the heat. The forecast is for a second consecutive day over 35, with strong hot northerlies.I’ve been painting our newly refurbished back deck, but the paint behaves strangely in the heat, so that’s on hold until the weather cools down. So, what’s been happening? 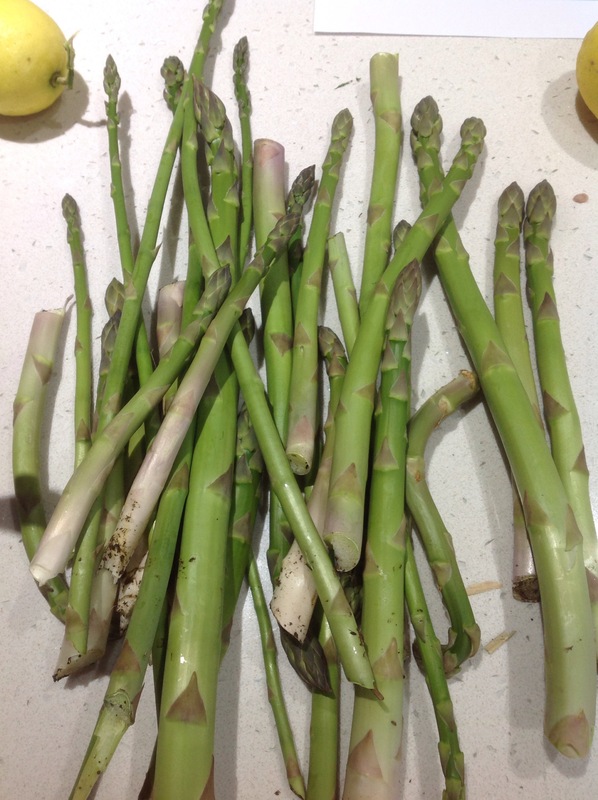 The asparagus is very happy and so am I. I get a good bunch every second day, and the whole family enjoys it. You can see the mulch in the picture, which is what the whole garden looks like in preparation for the heat. 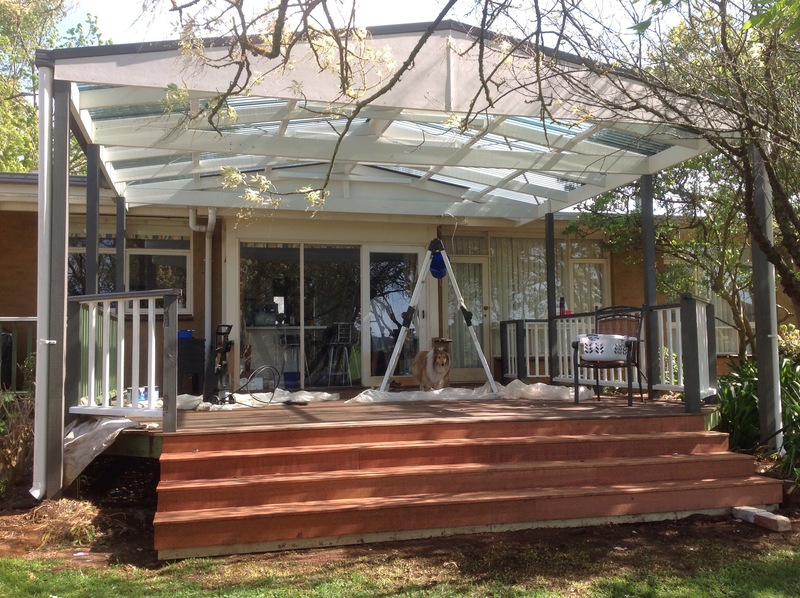 The back deck is coming along, but as always, I wonder what we were thinking taking on such a big job so close to open garden! The flowers have been stunning. Many will have finished by the 17th, especially in this heat, but some new buds are opening, and we may even have our first roses open. 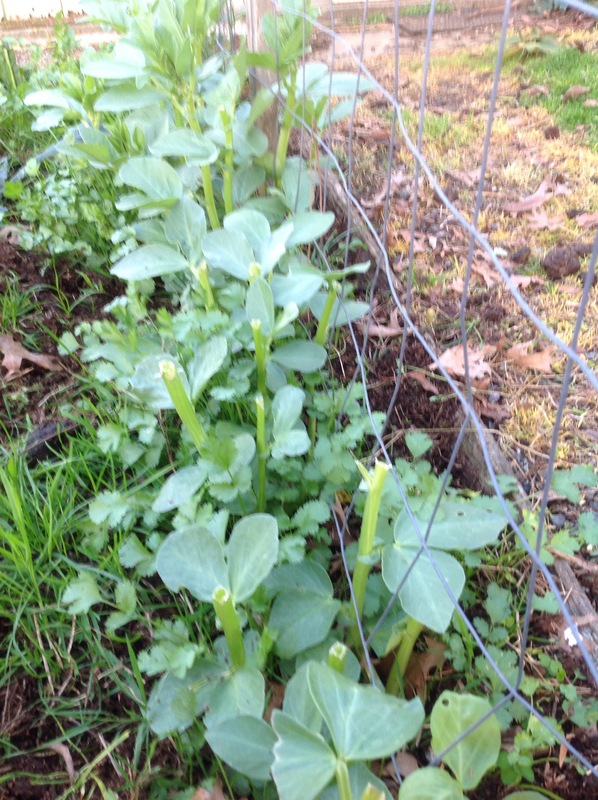 Some of the veggie patches are waiting for summer seedlings, and others are full of winter goodies. 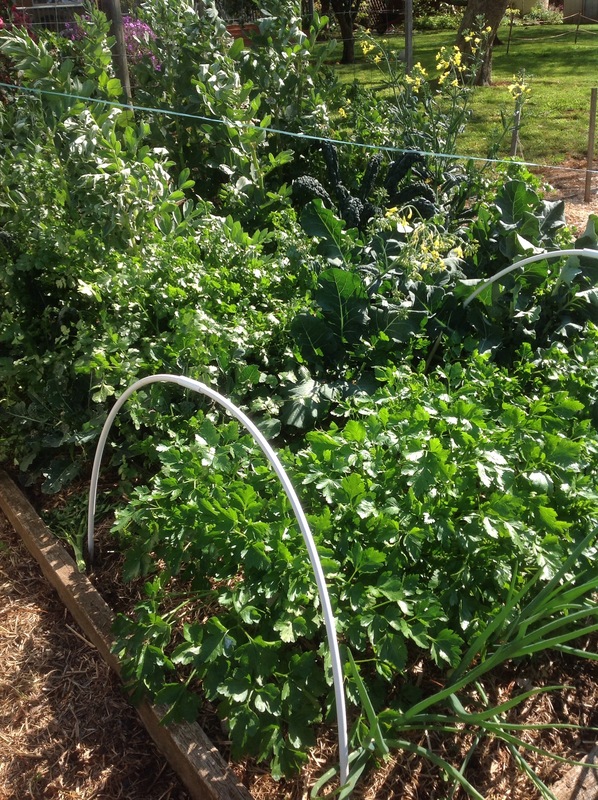 Here you can see broad beans, kale, broccoli, parsley and onions. Incidentally, this was the bed that the sheep got into earlier this year. You can see it’s made a full recovery! Our trampoline is gone. 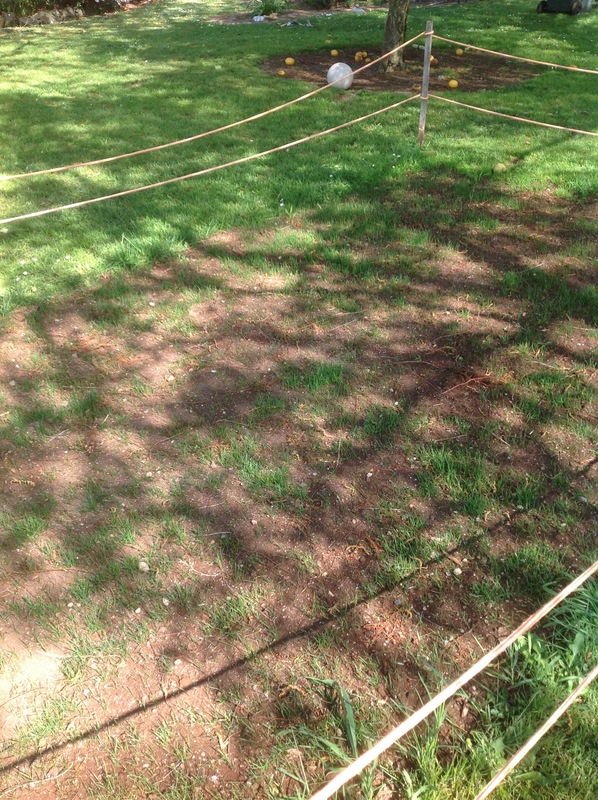 ( My babies are growing up) We’ve seeded the area and are babying it along. This photo was taken a few days ago, and it already looks much fuller today. The question is whether it will be ready for hundreds of wandering feet? We’ll see. 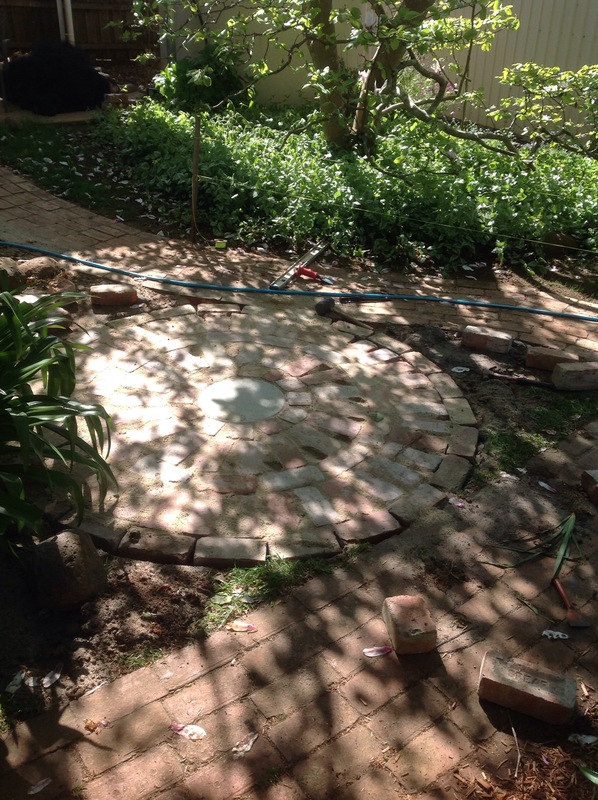 Also, in all the free time that we haven’t got, we’ve been brick paving. 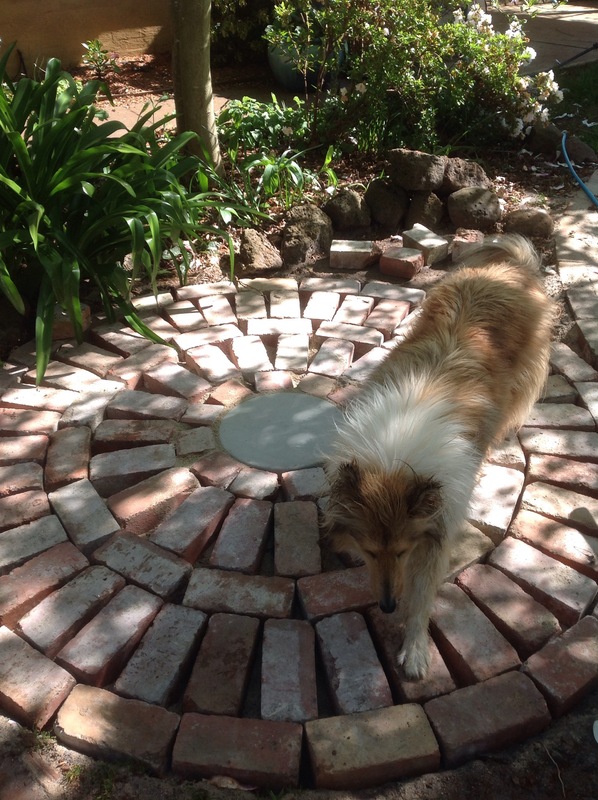 Molly the collie approves, and it should be a great place to sit and enjoy a cool drink over the summer, or even today! I’m really excited that my choir will be singing on Sunday October 25th at 2pm. Elegance and class! I play piano for the choir, who are just gorgeous! So, if you can, pop by and see us on October 17 or 25. 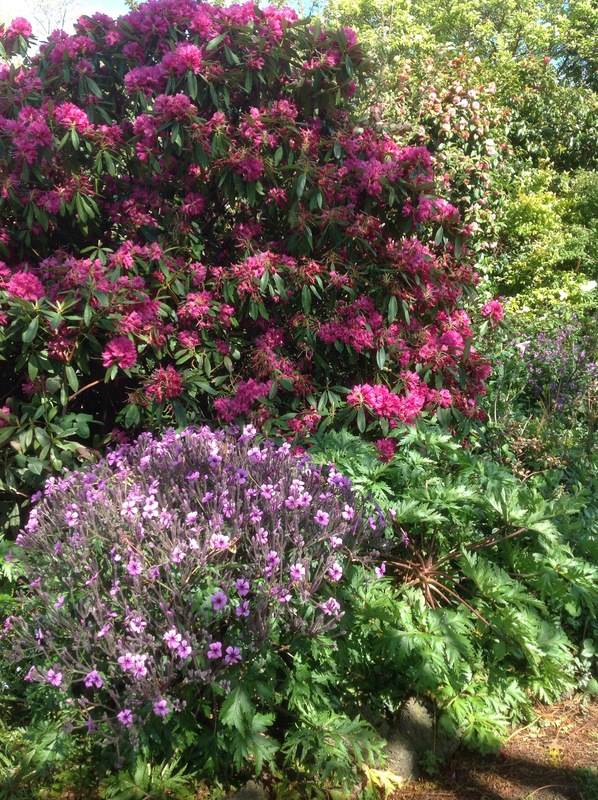 I’ll be running continuous garden tours, and there will be lots to see. Remind me to eat and drink when you see me! Well, the sheep didn’t get everything! 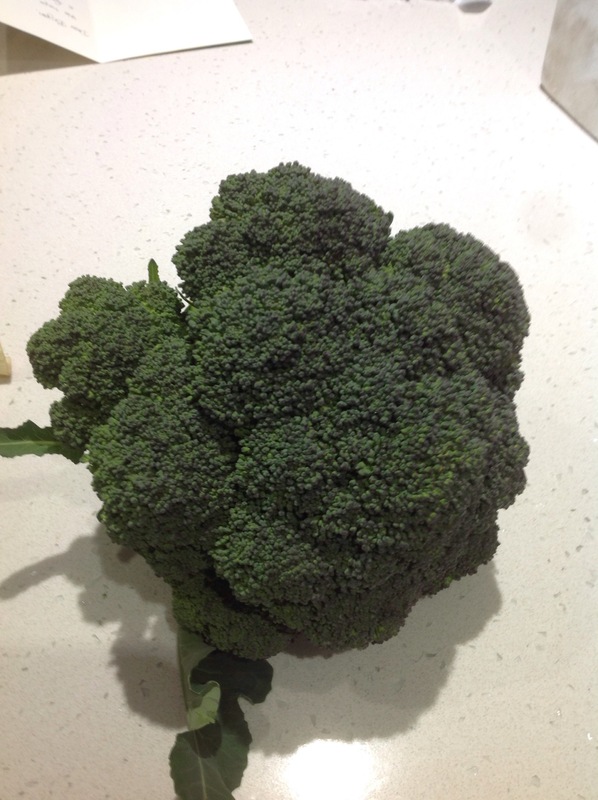 A few of the broccoli have recovered from the sheep in the garden incident, and we got the beauty this week. I’ve had a few snatched moments in the garden, so I’ve been putting together a couple of structures. My parsley, even before the sheep invasion hasn’t been doing well. It is still the same size, or even possibly smaller than when I put it in. I’m wondering whether the especially cold weather this year is holding it back, so I’ve decided to make a little greenhouse that Mr Gorgeous spotted for me at a garage sale. 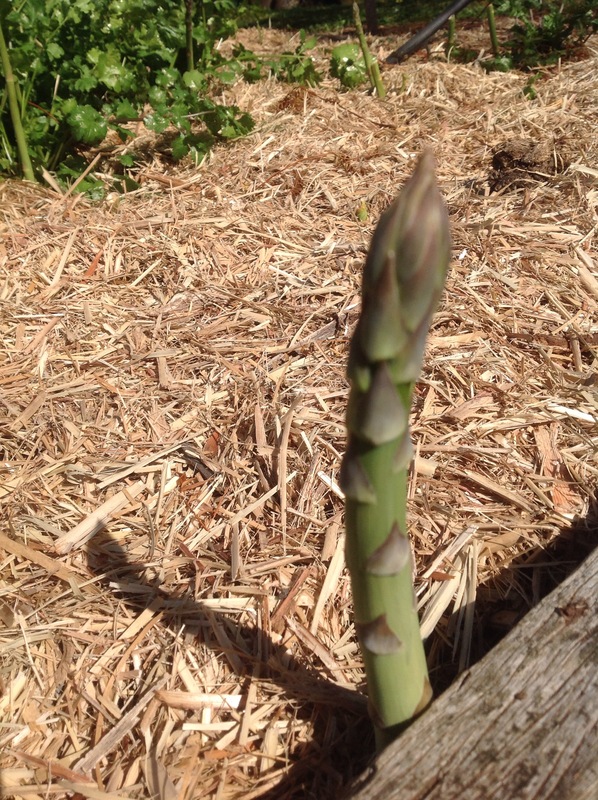 The greenhouse is much longer than my garden bed, so some of the asparagus in the neighbouring bed is getting some bonus warmth. Also, I thought about getting the chickens to do some work for me. 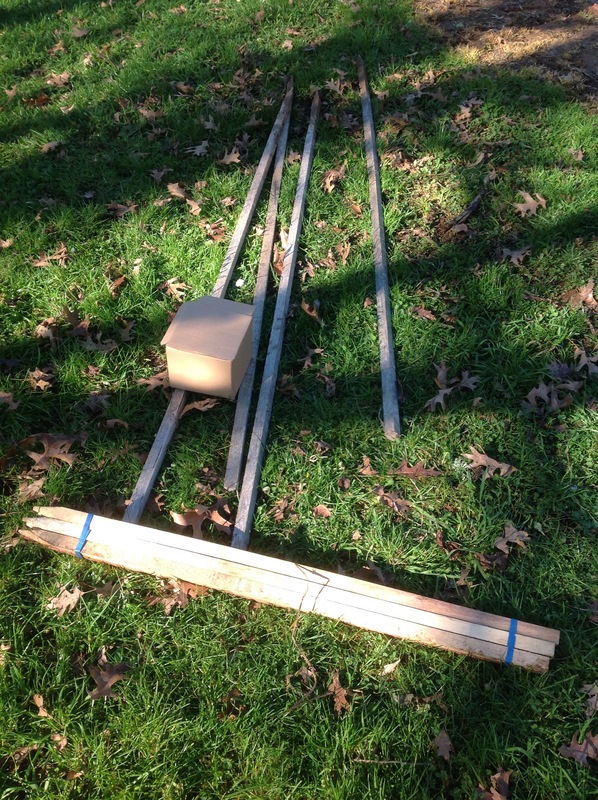 I recently bought a box of corners designed to work with garden stakes. They do have nail holes so you can make a more permanent structure, but I want to move it around, I’ve just rested the pieces together. My gorgeous 17 year old went and collected this lovely girl, and she had a busy afternoon scratching away. Hopefully she left lots of earthworms for the garden. Well, it’s official. 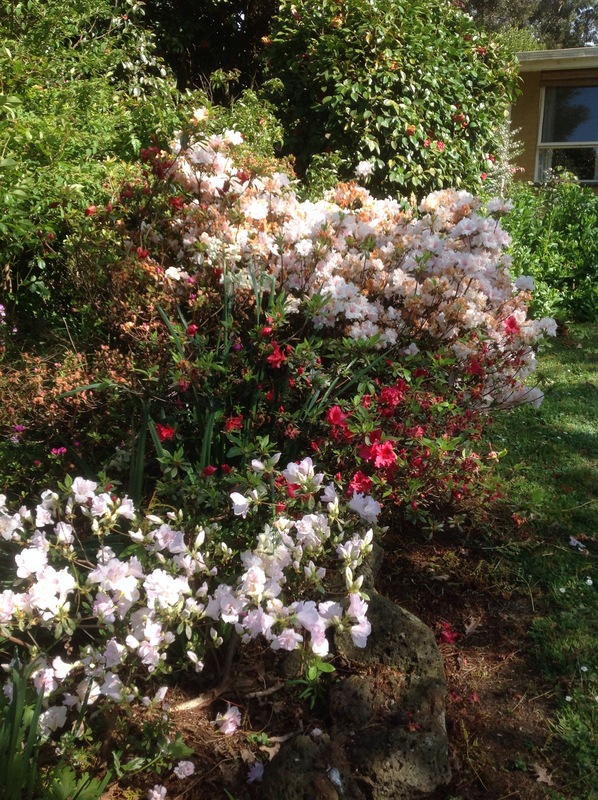 We are entering our garden in Gardivalia Open garden again, once again as a food garden. 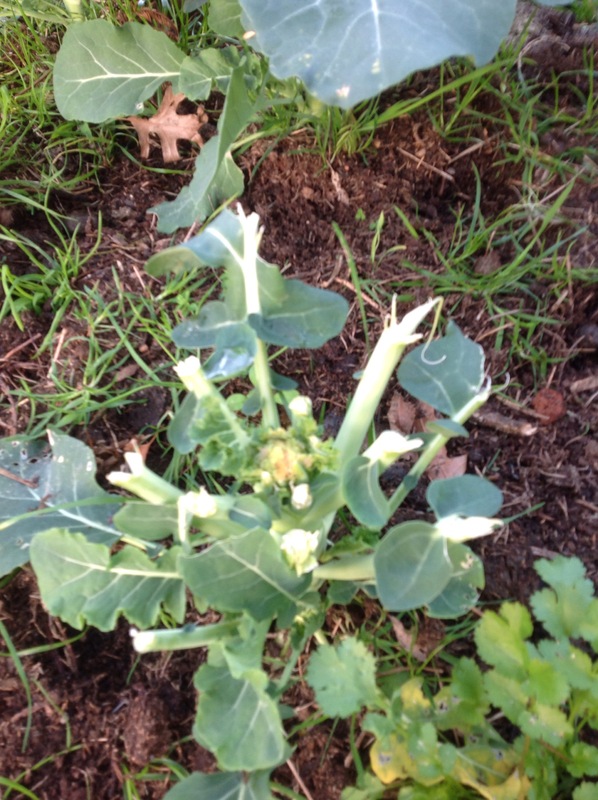 The sheep have celebrated this event in style by breaking in and feasting on the broccoli, kale and broad beans. Our dog that cries wolf, to her credit, did try to warn us, but she’s been so barky lately that we ignored her warnings. We spent a long time deciding whether to open this year, as I am super busy with a new job and we have a student in the house with major exams coming up. In the end though, I really enjoy opening the garden, and if I’m too busy to do the things I love, then I’m too busy. Also, some of the work we did last time, such as posters and labels will not have to be redone, so I think it is a manageable prospect. The vegetable patches are ticking along nicely, other than the sheep carnage, and I have a great calendar of what to plant when, thanks to my fantastic Mum, who did a count back from the date last time we opened, and worked out when we needed to plant things to have a good display on the day. 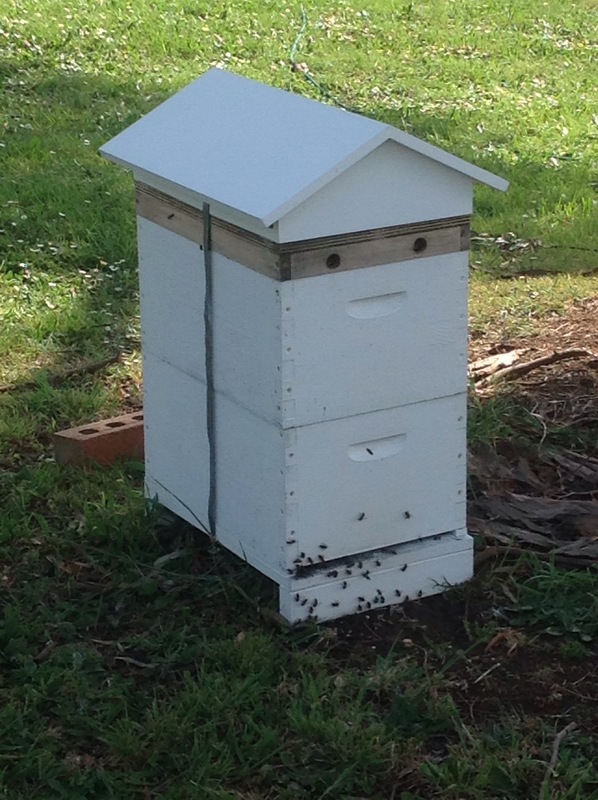 A new addition to the garden this year will be the bees, which have been busy (as bees) and seem very happy. It’s only a small hive (in numbers) at this stage, so I have to help them along with sugar syrup until they stay home and multiply. Our freeloading fowl (they’ve been moulting, so they have an excuse) are finally starting to give us eggs again, and have regrown pretty much all of their feathers. They’re a beautiful mixed bunch, so that they lay different types of eggs, so I can tell who is laying. In practice though, we just take the eggs we get, and don’t really know who’s doing all the work. For all I know, some of the chooks have been freeloading for years! I’ve included some before and after pictures of the garden bed that the sheep got into. 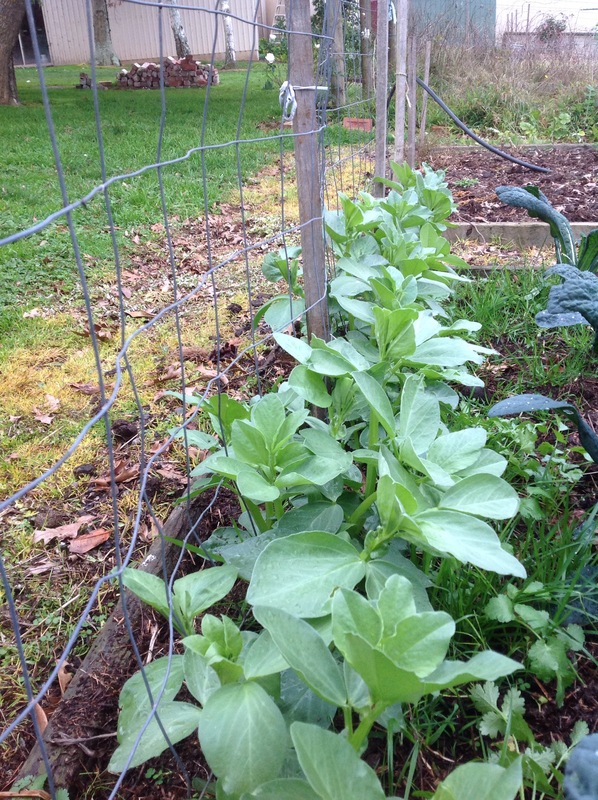 First up are the broad beans. My optimistic self believes that they will now shoot again and I will get double the beans. If not, well the sheep only attacked half the row! Next are the broccoli. I don’t hold such high hopes for these, as I think the hearts have been eaten out of them. Still, I’ll leave them in in case I get some secondary broccoli around the sides. 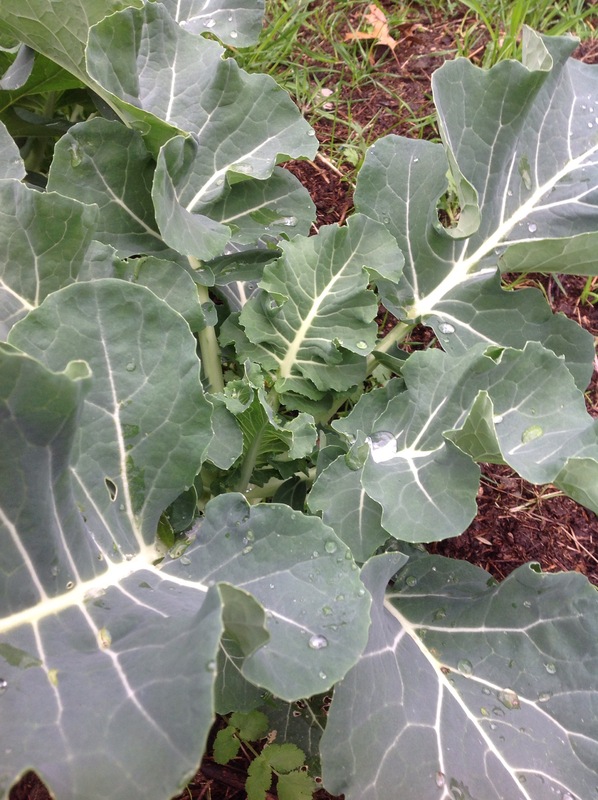 My optimistic self wonders whether the secondary broccoli might be bigger than usual, as the plant won’t have put a heap of energy into the main flower. 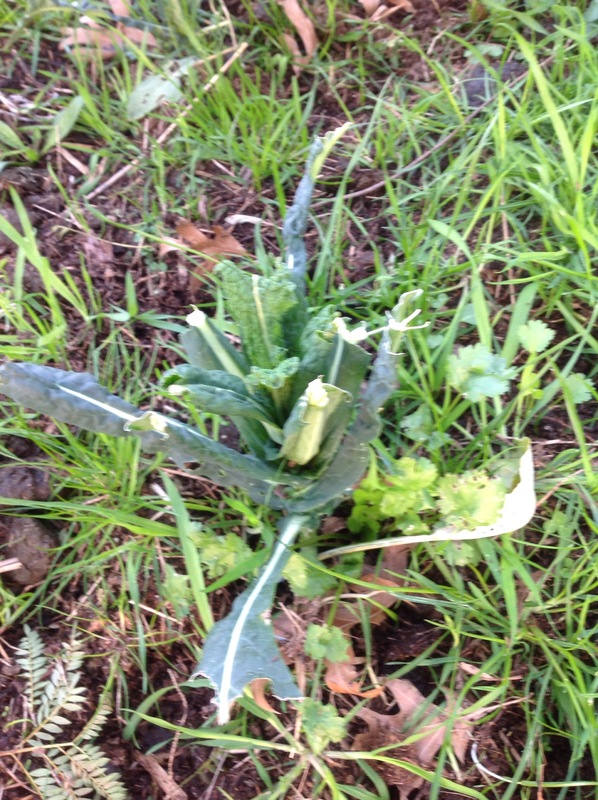 Finally, the kale has been well and truly enjoyed, but I think it will bounce back. I’m going to pop over to the Garden Share Collective Facebook page and share this post, as I’ve missed the deadline for the blog hop. With a nasty bug when it was due, I wasn’t up to much at the time. I’m all good now though, and ready to get stuck into some work! After a freezing cold fortnight,it looks like we are going to get some sunshine today, so I’m out to build a mini greenhouse. My parsley, which I planted two months ago, is going nowhere, so I’m going to try warming it up a little. Hopefully I’ll be able to keep warm at the same time! After a late start, my tomatoes have produced more tomatoes than I know what to do with. I have roasted, bottled, made sauce, salsa, paste, soup, and dried tomatoes. I have enought frozen for a tomato based meal once or twice a week for the whole year. 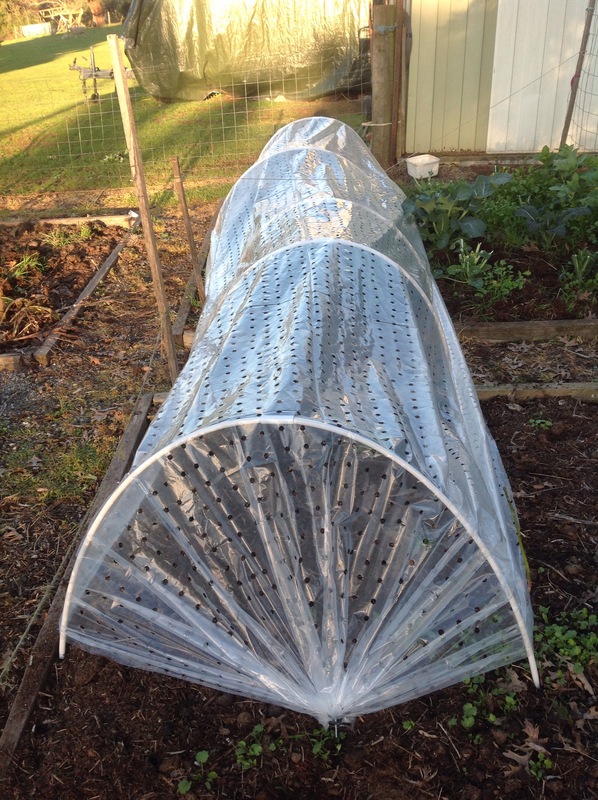 Now, however, the tomatoes are getting bad spots before they ripen, so it was with great relief that I have pulled them all out, and planted my winter garden. 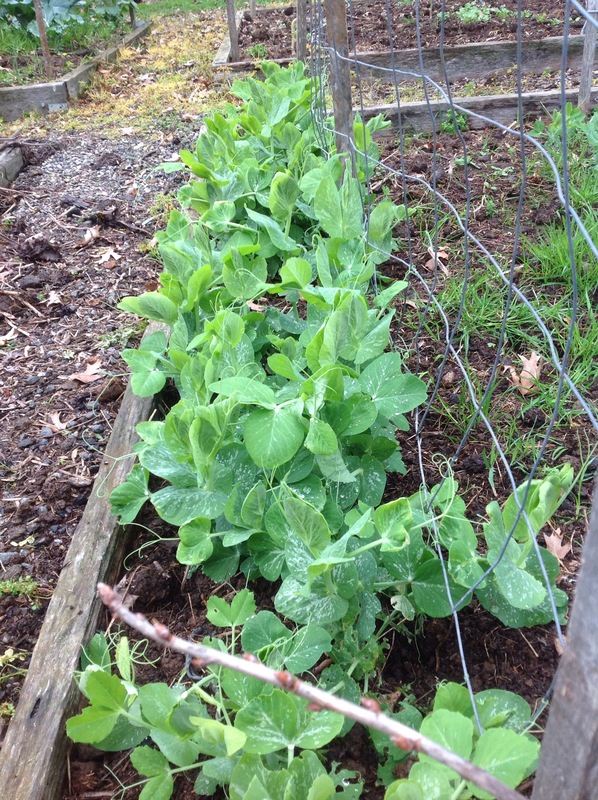 In have gone cabbage, broccoli, 5 colour silverbeet (two punnets by mistake, but the chickens will love it ), onions, broad beans and quite a few rows of peas, both eating and shelling. 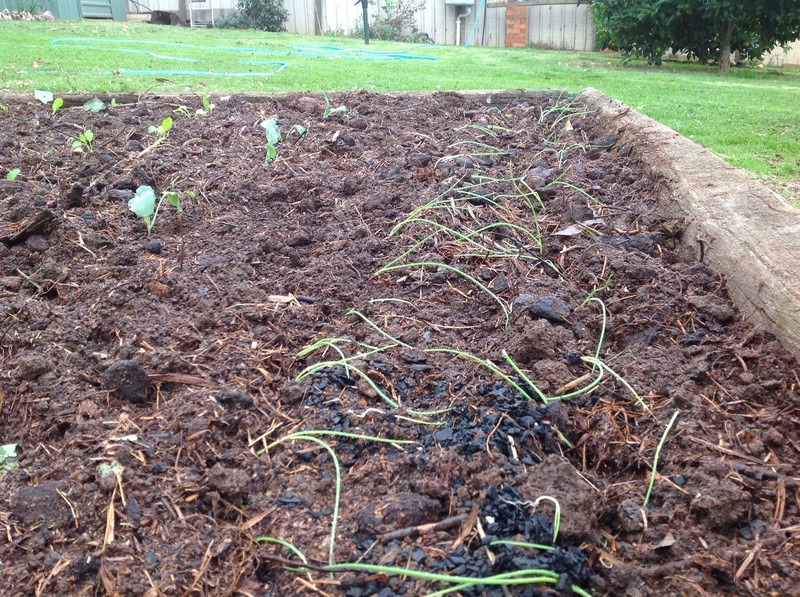 I’ve also planted some garlic. 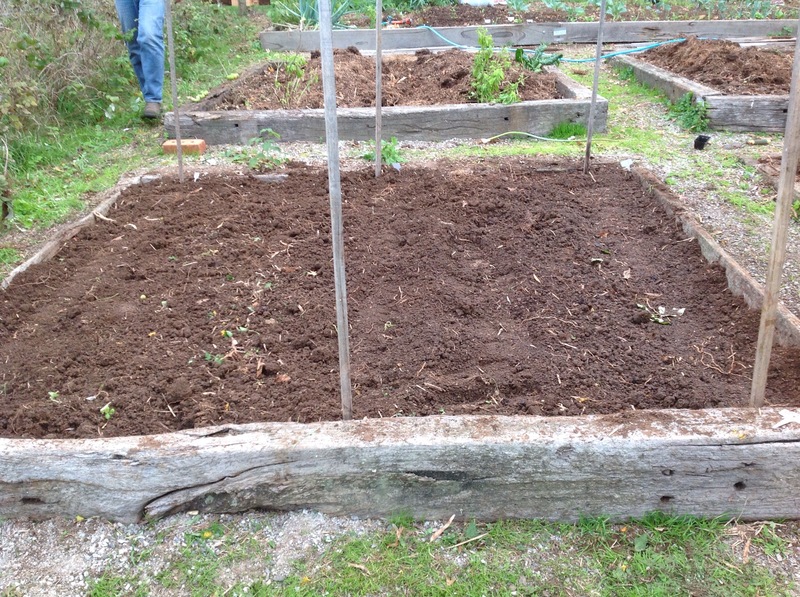 This bed has peas, and on the left you can see the legs of my lovely husband who dug the beds over, along with the Aunty Collector, now 12, who is a great worker. The garden is looking so tidy after the giant ramble of tomatoes have been removed. We filled the trailer to overflowing with the plants, and I must remember to plant less next year! 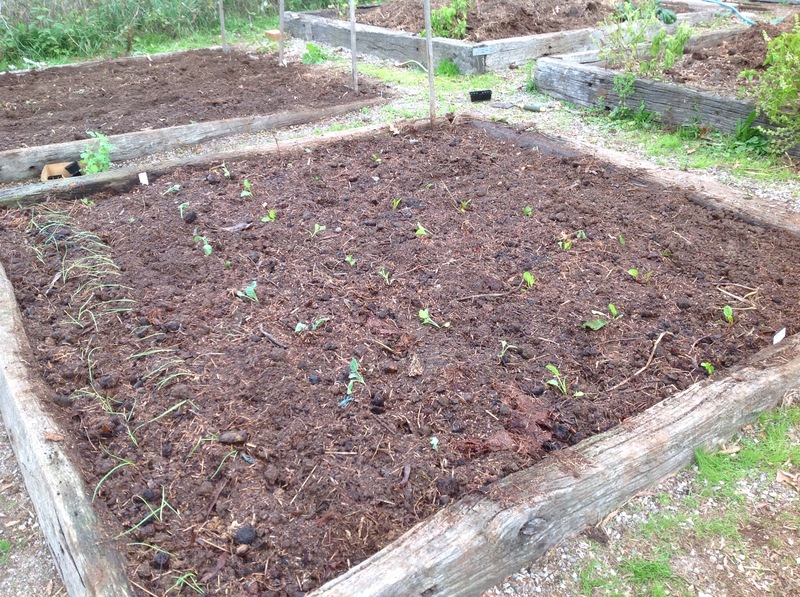 Here are the newly planted beds. 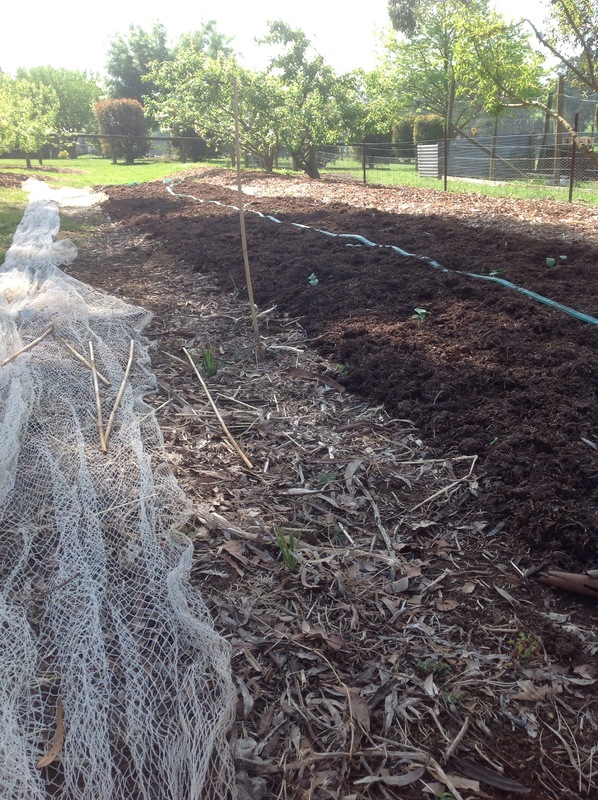 The Aunty Collector loves to watch Peter Cundall’s “Patch from Scratch”, and followed Peter’s instructions for planting onions, lying them down, and letting them stand up as they grow. The pumpkin harvest is good this year, but this monster was a complete surprise. It was labelled as a rockmelon, bu even once the leaves started growing, it was obvious I had something else on my hands. I have no idea of the variety, not butternut, as it was too bland, but it made great curried pumpkin soup. This month I will continue to plant, and clean up. 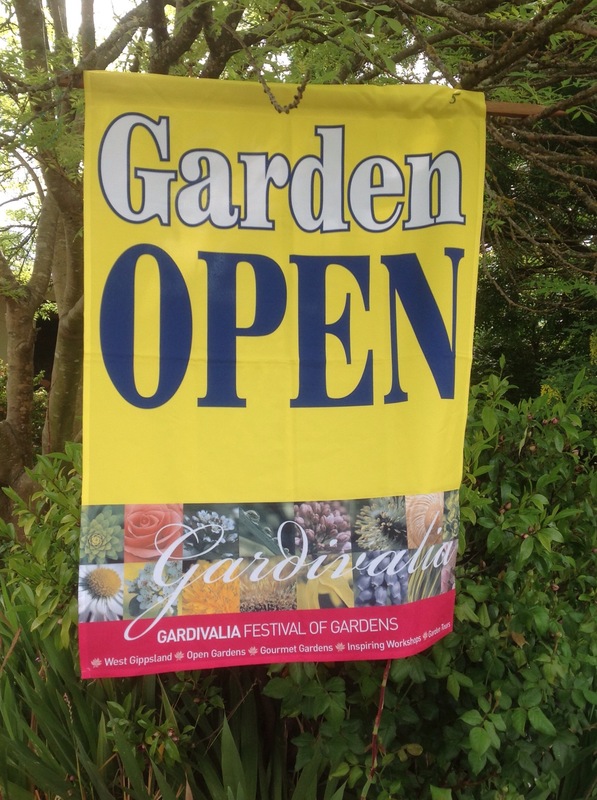 The really big task of the next two weeks is to make a final decision on whether to open the garden for Gardivalia. I’d love to, but have a heavy workload this year. Decisions, decisions! 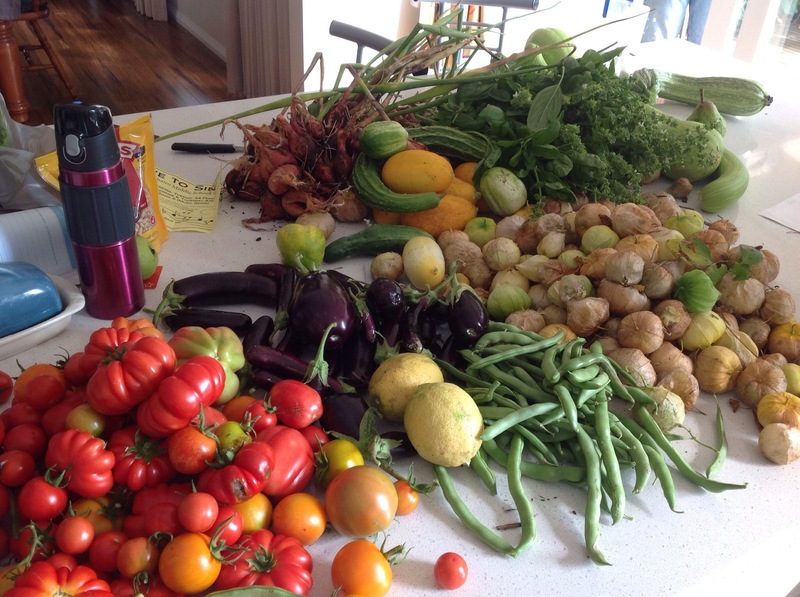 Thanks to Lizzie from the Garden Share Collective for hosting the blog hop. I think this post should be called March in the kitchen, as that’s where I’ll be spending every free moment. My bench is permanently covered in produce, which I’m trying to put away for the winter. Lots of work now, but hopefully it will mean lots of healthy organic meals later. Zucchini. I’m grating and freezing for soups and zucchini slice. I’m slicing and grilling , then freezing for moussaka type meals, and we’re eating them raw in salads, and grilled, barbecued, and stir fried in our meals. Eggplant. I’m salting grilling and freezing, as per the zucchini. We’re having lovely moussaka, including lamb from our property, and our eggs in the bechamel. Tomatoes. Lots or roasting and freezing, and making tomato sauce for pasta. I’m drying some in the dehydrator, and have plans to make tomato paste. We’re enjoying bruschetta with our basil too, and fresh cherry tomatoes of lots of colours with every meal, and for me, with every pass by the bench or the bushes I sneak a few more. Onions. 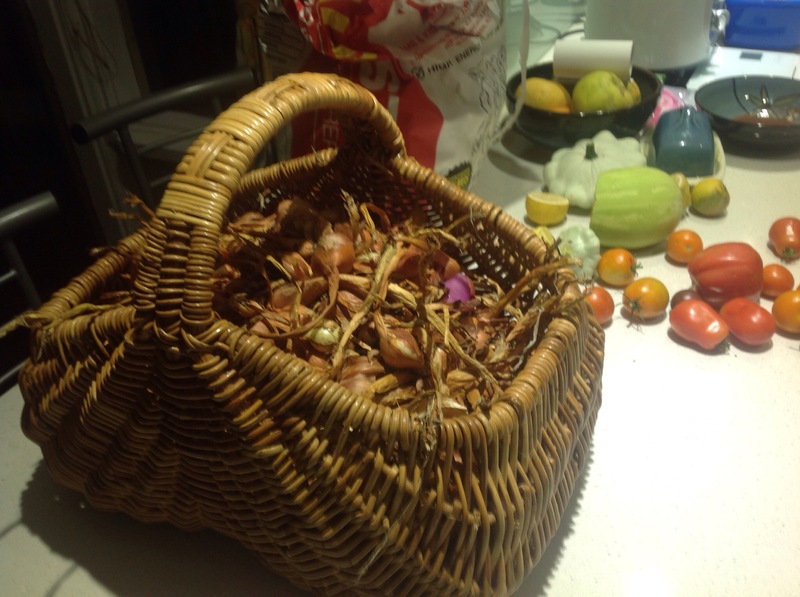 I’m not sure how well these little potato onions and shallots will keep, so we’re eating lots of these too, caramelised on bruschetta, and in every meal. Cucumbers. Heaps of these coming on too. 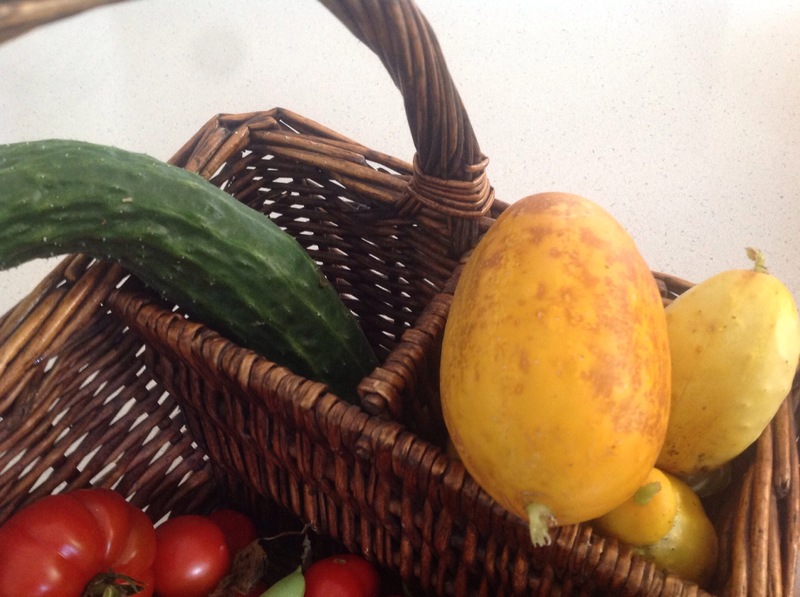 We’re eating them fresh, the boys have them in their lunch boxes each day, and I’ve been doing some Japanese light pickle recipes. Almost none of them are regular varieties, as you can see from the picture below. Beans. We’re just getting enough to eat, if we eat lots, so I’m not putting these aside. I’m just putting them in every meal. Tomatillos. Thanks to my lovely friend Omega, I have a recipe for tomatillo salsa, so I have put aside about 15 meals’ worth or so, so far. I can use this salsa on potatoes, corn chips, or anything I want to spice up. I made a paleo version of nachos last week, roasting up zucchini chips, instead of corn. Absolutely delicious, but it took about 3 hours to roast enough chips for the family, so I’m not sure that I’d bother again. Corn. Steamed with every meal. 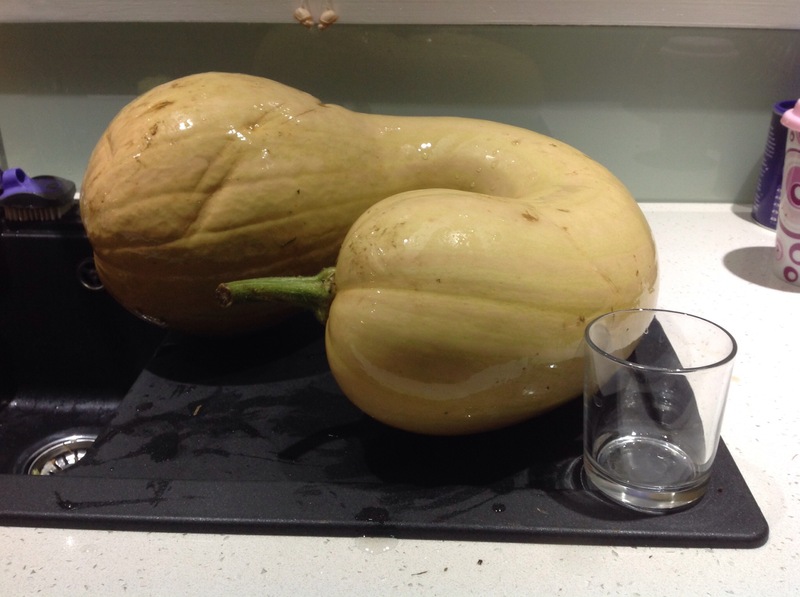 As well as that, we are getting small amounts of squash, and a good supply of herbs. Not much at the moment, as I’m still worried that the predicted long hot summer will have at least a small burst. I have baby bean plants. Just keep picking, just keep picking. At some point soon, I’ll have to decide whether our garden will go in the open garden again this year, so we need to go out and go have a good look and a think. Thanks once again to Lizzie from the Strayed Table for hosting the blog hop.